Hear ye! Hear ye! Citizens of Stormfall, war, destruction and chaos rages all across the lands, in lands that have seen much suffering and in lands that have until recently, been untouched. With this week's edition of the Stormfall Chronicle we return to the beacon wars. The war that has engulfed the entirety of the realm and claimed an unfathomable number of lives. The suffering has been great and we wish that the Chronicle could bring you news that an end to this terrible war is in sight, yet alas, we cannot. Unfortunately, not only has the fighting increased, but it has spread to lands that have, until recently, been a safe harbor for refugees attempting to escape the conflict. The lands I speak of are those of the King of Kings league. As many of you know, the King of Kings league has sided with the noble Knights of Camelot in the beacon wars. These two leagues are all that remains of the original "Alliance" which previously held tremendous power over the entirety of the realm and in some regards, still does. Once declaring that they would no longer stand as a neutral party in the battle between the Knights of Camelot and the Knights Templar, KoK was quick to act, striking out with violent force and crushing a number of KT beacons. This time, it was the Knights Templar turn to act. 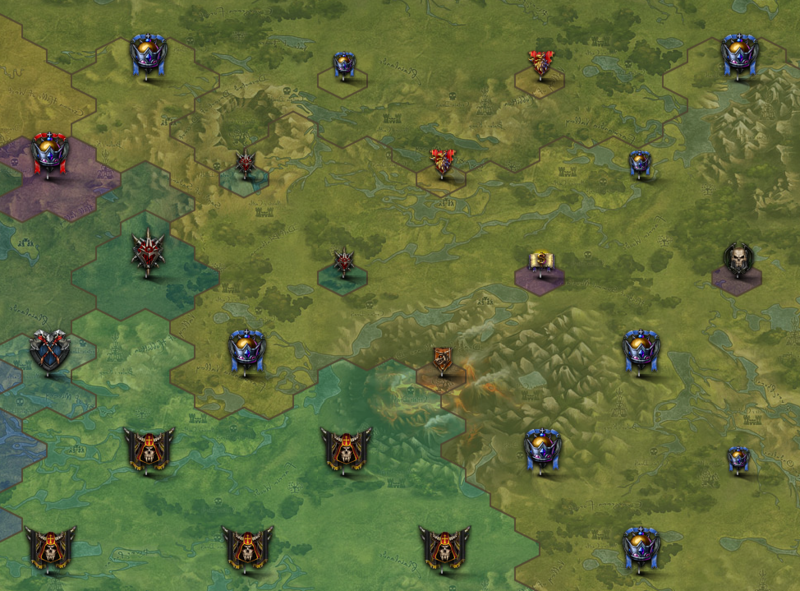 They struck fast and furiously, sending their forces in KoK lands and seizing a large number of their beacons. 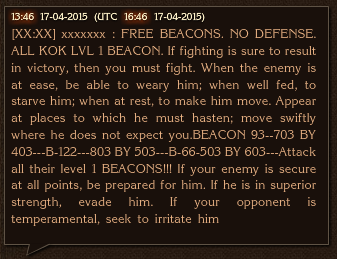 While at the same time, a vicious battle was fought between KoC and KT over beacon number 39. As seen in the image above, the battles were gruesome and bloody. If you will notice, The Throne of Kings entered the fray, an original member of the fractured "Alliance" they were more than happy to rain retribution on the Knights Templar league, who some blame for the downfall of ToK. A number of leagues took the bait and acted. To name a few, were the Reservoir Dogs, Search and Destroy and the Werewolves. The Reservoir Dogs appeared to be the ones willing to take make the boldest stand, as they attempted to level the beacon they seized from KoK. Unfortunately for these leagues, the power of the King of Kings leagues was too much to bear. Swiftly and surely, the forces of KoK rallied within their lands and the troops took up their arms. The land that was untouched was wounded, but not beaten. Retribution was swift and absolute from its citizens. The King of Kings quickly reclaimed their lands and wiped the invaders off the map, as seen from the image above. The Reservoir Dogs resources that they spent upgrading the beacon they seized were ill spent and quickly lost as they were sent fleeing from the lands. Despite this victory for KoK, the beacon wars rage on and no end in sight, as of yet appears on the horizon, although fractures appear to be surfacing amongst some of the greatest heroes in the land, as the constant stress of war wears them down. Most notably is Friction, the warrior who once fought on the side of the Knights of Camelot, who infamously switched sides to battle alongside the Knights Templar. Rumor has it that this warrior is thinking of laying down his arms. Could this be true? It is uncertain as of yet, but as always, the Stormfall Chronicle will be there to report and share with you the news that matters most from across the lands of Stormfall. Until then, be safe and be on guard, the drums of war beat on. This article was written by Nathan McDonald, who granted permission for it to be posted on Plarium.com. Any thoughts or views expressed herein are the player's own, and do not necessarily reflect the views of Plarium Global.